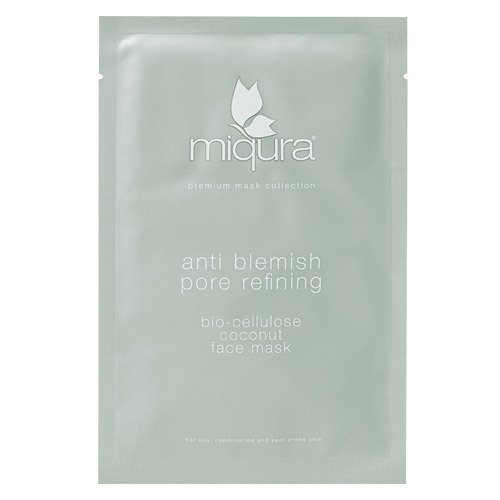 Miqura Anti Blemish Pore Refining Face Mask is a unique bio-cellulose mask, made with 100% natural fermented coconut juice, making the mask fiber 1000 times finer compared to traditional cotton sheet face masks. The mask will make up an extra skin layer and its delicate structure allows the skin to absorb all the gel. The gel is made of original and pure active ingredients that are antioxidant, smoothing and nourishing to the skin, and of Asiatic bamboo that is deep-acting and absorbs bacteria, impurities and micro particles. Miqura is a revolutionary brand, focusing on quality, unique results and natural skin care. All Miqura skin care products are based on natural and environmentally friendly ingredients. They offer an exciting range of skin products to complement your current needs without compromising your daily routines. Water, Butylene Glycol, Glycerin, Propanediol, 1.2-Hexanediol, Olive Oil Glycereth-8 Esters, Carbomer, Arginine, Xanthan Gum, Panthenol, Allantoin, Camellia Sinensis Leaf Extract, Charcoal Powder, Phenoxyethanol, Ethylhexylglycerin, Dipotassium Glycyrrhizate, Sodium Citrate, Polysorbate 20, Disodium EDTA, Fragrance, Sodium Hyaluronate, Melaleuca Alternifolia (Tea Tree) Leaf Oil. Use on cleansed skin. Remove the outer protective layer, place mask to cover face, then remove after 15-20 mins. Massage in excess. Discontinue use if signs of irritation or rash appears. 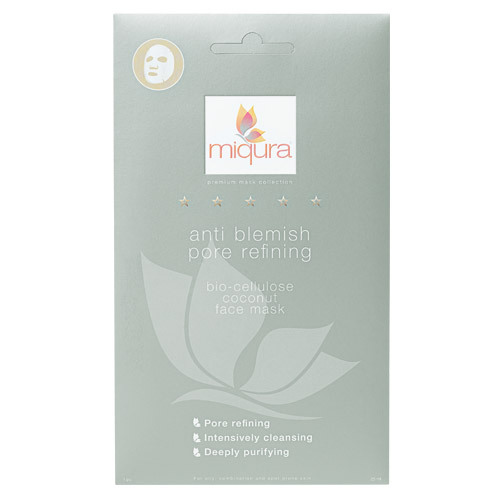 Below are reviews of Miqura Anti Blemish Pore Refining Face Mask - 25ml by bodykind customers. If you have tried this product we'd love to hear what you think so please leave a review.